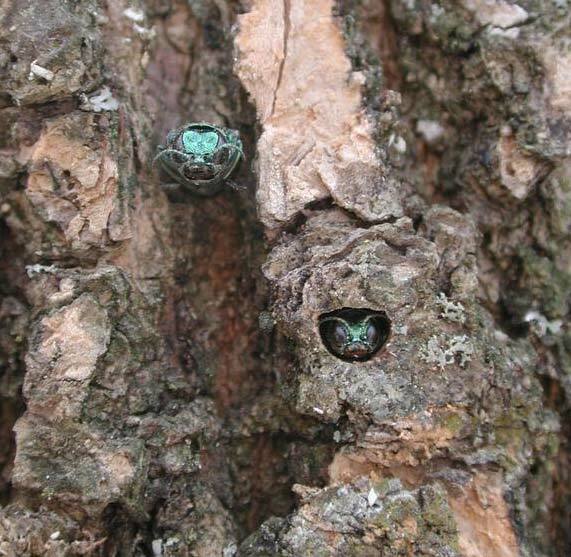 Emerald Ash Borer was confirmed in Lancaster County in August 2018 and in Mahoney State Park (in Ashland, NE) in 2018. 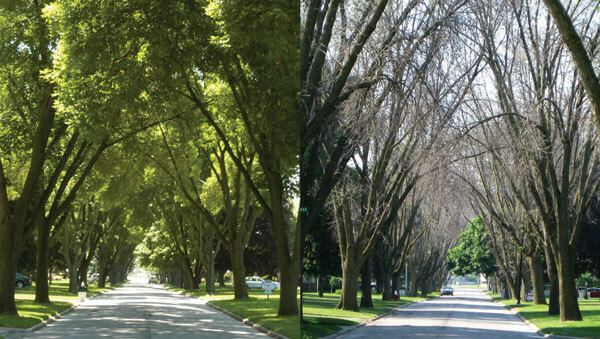 In 2016 EAB was found in 2 locations in Omaha, NE and in Greenwood, NE. See current EAB location map here. 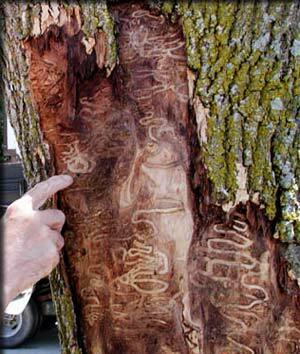 Learn more about EAB and what it means for your ash trees here. Quarantines on movement of certain wood products learn more here. 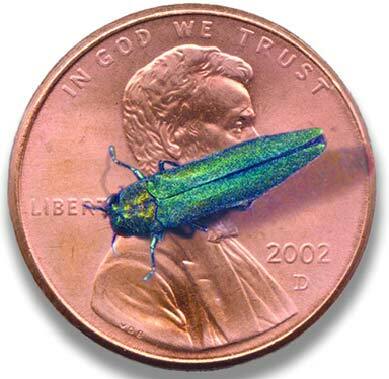 Also referred to as EAB, Emerald Ash Borers are wood boring insects with a one year lifecycle. They are metallic green with bronze on the head and under the elytra. About 13 mm long, indented along the elytra. Larvae are milky white with triangular segments. Adults lay eggs under the bark of ash trees. The larvae eat the tissues of the tree as they grow. 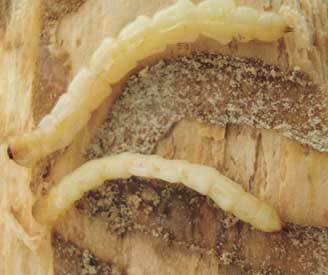 Once they are mature the larvae exit the tree by boring a D shaped hole in the bark to escape. The D shaped exit hole is one way used to find an EAB infestation. The Nebraska Department of Agriculture (NDA) first confirmed emerald ash borer (EAB) in Nebraska on June 6, 2016 during a site inspection in Omaha’s Pulaski Park. Nebraska became the 27th state to confirm the presence of EAB, joining neighboring states of Iowa, Missouri, Kansas and Colorado. NDA has issued a quarantine prohibiting ash nursery stock from leaving the quarantine area. The quarantine also regulates the movement of hardwood firewood and mulch, ash timber products and green waste material out of the quarantine area View map here. 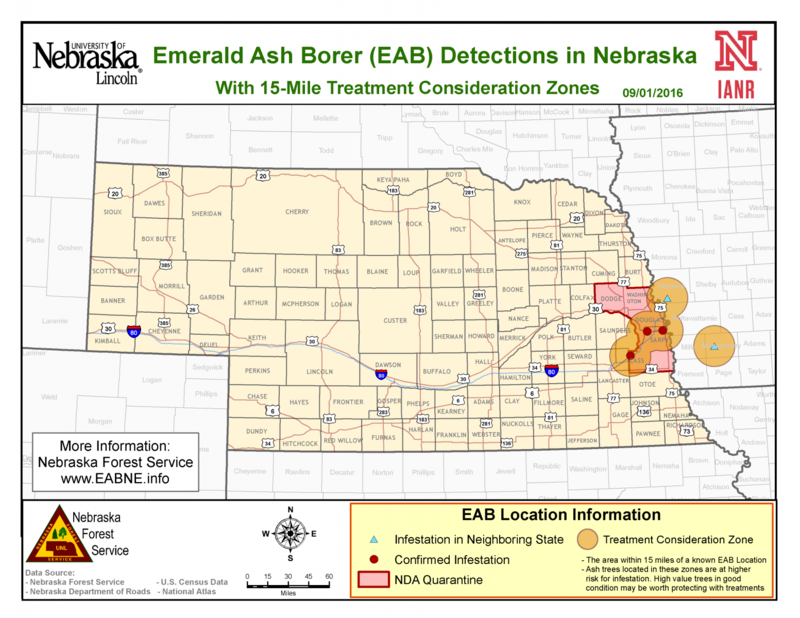 It is not recommended to chemically treat ash trees to prevent EAB unless the tree is located more than 15 miles of a confirmed EAB infestation (see map above). There is a limited number of times many trees can be chemically treated so waiting until you are in the quarantine area will maximize the amount of times you can treat the tree. 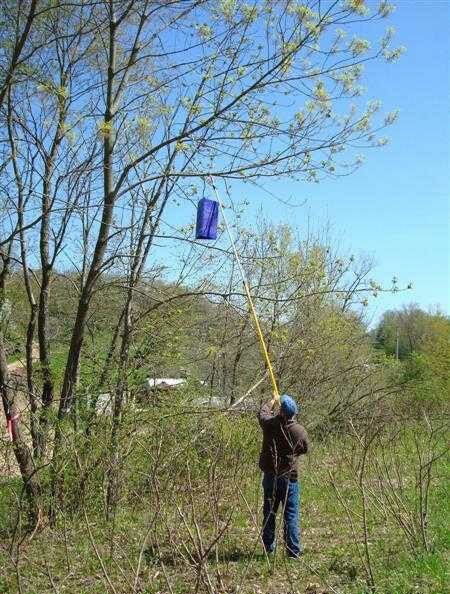 Treatment of an ash tree to prevent damage from the EAB is between March and mid-June Learn more here. This is due to the chemical treatment needing to be distributed throughout the tree at a specific time to kill EAB larvae. There are 3 species of wasp being used in many states including Michigan since 2007 as a biological control View this fact sheet for more information. Top dieback and increased woodpecker damage. 1/8 inch D-shaped borer holes along the trunk. Suckering occurring at the base of the tree. Larval galleries under the bark. 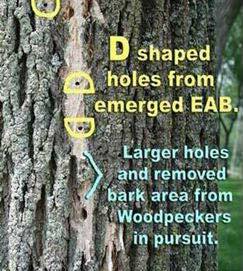 If you find a small D shaped hole or have an ash tree declining and want it inspected for emerald ash borer contact us on the report a sighting page. Download fact sheet here. Originally introduced from Asia. First found in Michigan in 2002. Spreads through the movement of ash wood products and on vehicles from infested areas. There are state and federal quarantines in place to prevent the spread of EAB by preventing the transport of ash tree products. Refer to this website to learn more about these quarantines.